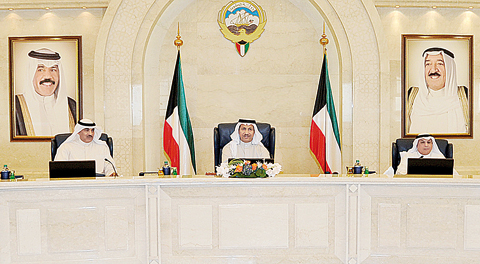 KUWAIT: The Cabinet reviewed the State Audit Bureaus’ report of the second half of the fiscal year 2015/2016, and urged all state institutions to adjust their fiscal position and heed auditors’ comments and recommendations. The Cabinet also discussed the fifth annual report of the economic committee of the activities and performance of Kuwait Stock Exchange in the fiscal year 2015/2016 as well as its second annual report on the performance of the National Fund for Small and Medium Enterprises Development. During its weekly meeting yesterday, the Cabinet reviewed the report of following up the first half of the 2016-2017 plan, Minister of State for Cabinet Affairs and Acting Justice Minister Mohammad Abdullah Al-Mubarak Al-Sabah said after the meeting. The government has been making progress in terms of carrying out the laws issued by the National Assembly, compared with that of the last year’s plan, he added. The current plan witnessed a rise in spending by 22.6 percent compared with 19.9 percent of the last year, he noted. Up to 15 percent of projects listed in the preparatory period of the first quarter of this year were carried out, he said, indicating that some 12 laws out of 40 have been enacted. The cabinet appealed to all ministers to take measures so as to achieve quickly the rest of projects, Sheikh Mohammad said. Meanwhile, the report of State Audit Bureau for 2015-2016 showed that violations committed by the governmental bodies decreased and this affirms the government’s serious eagerness to address these violations, he said. Also, the Cabinet listened to a presentation made by Minister of State for Planning and Development Hind Al-Subaih on the development plan follow-up report of the first half the FY 2016/2017 (starting from April 1st to September 30th). In its report, the minister urged all state institutions to accelerate the execution of the plan projects and the finalize the planned draft laws. Furthermore, the Cabinet reviewed a report submitted by the public services committee about South Mutlaa city projects. The cabinet then assigned the Public Authority for Housing Welfare provide it with a quarterly report about the project development. In the meantime, the Cabinet has strongly condemned Yemeni Houthi group and forces loyal to former president Ali Abdullah Salah for firing a ballistic missile towards the Muslims’ holiest city of Makkah. This sinful act is a provocation of Muslims’ feelings, and is showing disrespect of the blessed city, and disregard of Islamic sanctities, the cabinet stressed. It added that this criminal act is tantamount to an aggression against all Muslims, and represents a grave development in these groups’ defiance of the international community and international efforts to reach a ceasefire to pave the way for a political solution to the civil conflict in the Arab country. On the other hand, the Cabinet welcomed Saudi security agencies’ success in foiling a terrorist attempt to detonate a booby-trapped car in Al-Jawhra stadium in Jeddah during a football match between Saudi Arabia and the United Arab Emirates. The Cabinet wished the sisterly Saudi Kingdom everlasting stability and safety to its people. At the onset of its weekly meeting, held at Seif Palace yesterday and presided over by His Highness the Prime Minister Sheikh Jaber Mubarak Al-Hamad Al-Sabah, the Cabinet lauded the inauguration of Sheikh Jaber Al-Ahmad Cultural Center as a new achievement reflecting Kuwait’s civilized image. It also noted that various other cultural projects are expected to see light soon. These cultural achievements boost Kuwait’s image as a beacon of Arab culture and a country embracing creative, talented and intellectual people out of strong conviction in the noble role of culture in nations’ development and renaissance, the cabinet stressed. It has also warmly welcomed Kuwait’s guests who attended the inauguration ceremony of the center. At the advent of the meeting, the cabinet was apprised of two letters sent by Iraqi Prime Minster Haider Al-Abadi to His Highness the Amir Sheikh Sabah Al-Ahmad Al-Jaber Al-Sabah. The two letters focused on bilateral relations and the latest developments in Iraq as well as regional and international issues of common concern.